Clean, narrow sightlines with the strength and durability of aluminum. Be Inspired with Design Freedom. These patio doors are designed with clean, narrow sight lines that only the strength and stability of aluminum can provide. Milgard Aluminum Series patio doors are built with high quality components that start with our rollers and go all the way to the frame itself. 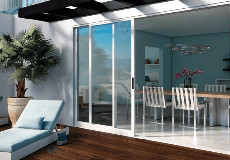 Aluminum patio doors provide narrow frames and clean lines offering a very contemporary look in any home. When a modern architectural style is desired, these patio doors can achieve a variety of contemporary design requirements. Aluminum patio doors beautifully accentuate the clean, thin lines of contemporary design with their narrow sight lines and modern metal look. They have an extremely long life and are highly resistant to outside weather elements due to their rigidity and durability. 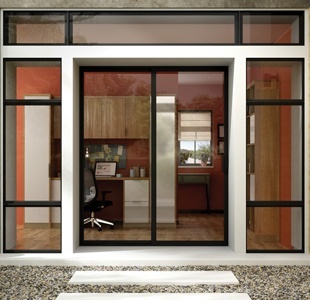 Milgard® Aluminum Series patio doors rate high in appearance, strength and value. We stand behind our products with a Full Lifetime Warranty to the original owner. Plus, if you sell your home, the warranty remains in place for the subsequent owner for 10 years from the install date of the original warranty. Of all the choices of replacement sliding door companies, Milgard was the only one that had exactly what we were looking for, aluminum bronze, to match our windows. This product is well crafted and beautifully designed. I've had my Milgard doors and windows for 25 years and they look as nice today as the day they were installed. Exactly what we were looking for to retain the look of a 1960's Eichler style home. Because of their clean, narrow sightlines, Aluminum Series patio doors provide an almost seamless view outside. You can select which way the door slides opens, either left or right. Aluminum Series Sliding Patio Doors is rated 3.9 out of 5 by 210.